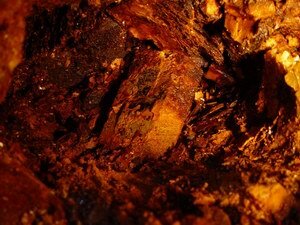 After the temporary high subsided from the discovery of the 'The Piece' as it has become to be known, we were curious as to what would develop next. As mentioned, there was a clear trend developing. If it held, it did not require a Harvard 'man' or a rocket scientist, to predict where the next pocket might be. That was good news because I am neither. So tapping into all of my 10th grade geometry skills, I triangulated the next spot to drill in the remaining 4' of pegmatite exposed along the trend line. Incredibly, after 3 feet, the drill dropped into a space. Several holes drilled to the side and down dip yielded the same result. We had found pocket 11. 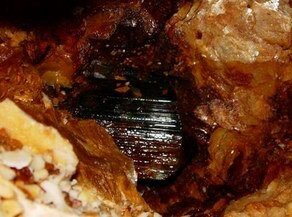 For fun we decided to sample this cavity with the blowpipe. Our efforts yielded a little tourmaline and unlimited quantity of rusty water. We were unable to blow this cavity dry. This one appeared to be large. At the right it isn't difficult to see which one of us operated the blowpipe. Richard is on the left. We had found the pocket yet we had not opened it. Ernie Schilcter, a well known New England dealer, had come to visit so I wanted to be most 'sensitive' in its opening. Everywhere we drilled we seemed to either drill into the pocket or into material that was so soft blasting would be ineffective. As initially no one was on hand to view the outcome, I decided to blast a hole we had drilled that was probably too close. Sure enough this shot was totally digested by the pocket. No rock moved. (I worried needlessly as to the damage I may have wroth) Fortunately, there were enough fractures that we were able to open a small portal with our air operated chipping hammer. We received high marks for 'sensitivity' as the previous blast went undetected. Once opened, this pocket proved to be somewhat different than the others. The obvious difference was, unlike all of the previous 10 pockets, this one had many large quartz crystals. It did have tourmaline. In fact a few of the pieces turned out to be quartz crystal on tourmaline. Similar to MMP7-04, cleaning out this pocket was to be dirty work. 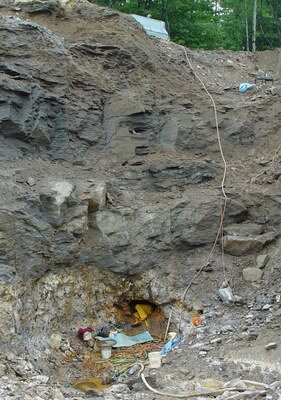 Faults in the country rock had assured that for eons water had percolated from the surface and down through the pocket. 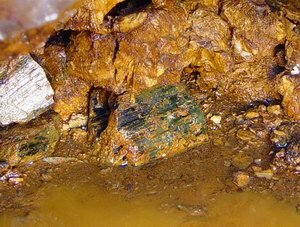 In the picture to the left a large terminated tourmaline can be seen lying in the rusty water. Two more are to the left. The jumble at the back is cleavelandite had collapsed from the roof. Pocket 11 would prove itself to be huge reaching nearly 15 feet in length. Unfortunately it was also quite narrow, just about the size of a typical culvert. Consequently, cleaning it out required lots of 'belly time'. Luckily most of the work was done July. In November, working this pocket would have been torture. Pocket 11 produced finer large tourmalines than pocket 7 but not near the number of small ones. Both pockets were similar in total volume. 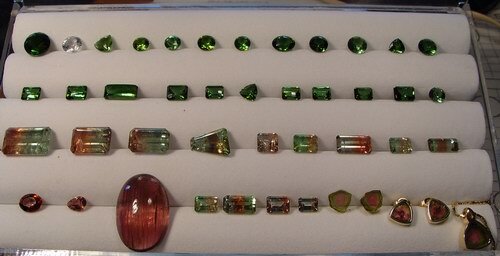 Some of the lesser tourmalines and beryl fragments went to Dennis Creaser , Creaser Jewelers of S. Paris Maine to be cut. Here are some of the gems. The tri-color stones are exceptional.